The explorer, cartographer and navigator, Captain James Cook was born to James and Grace Cook, in a clay-built cottage in the village of Marton in 1728, and he lived for a short time in the village, until the family moved to Great Ayton. A contemporary drawing of the village by George Cuit has revealed the cottage to have significantly deteriorated by as early as circa 1788, a precursor to it being levelled by new local landowner, Bartholomew Rudd, in the 1790s. It was very close to where the original manor house Marton Lodge eventually stood, to which Rudd made many alterations. The tiny community of Marton, Queensland, Australia, upstream from Cooktown on the banks of the Endeavour River, was named after James Cook's birthplace in remembrance of his 7-week stay in the region in 1770. There is also a town in New Zealand named Marton (renamed thus in 1869 in honour of Cook's birthplace). The name of the Yorkshire village derives from a mixture of Old English and Old Norse (marr-tūn) which means Marsh farm/settlement. In 1853, the ruin and the land that is now the park were bought by the Middlesbrough ironmaster H. W. F. Bolckow. He built a new hall, which, after serving for a short period of time as a museum, was destroyed during demolition by fire in 1960, after standing empty for several years. The site is now home to the Captain Cook Birthplace Museum, opened in 1978. In addition to viewing the large collection of Cook-related objects at the museum, visitors can view a grade II listed granite urn erected by Bolckow in 1858 on the site of the demolished Cook cottage. There is no record of the foundation of St Cuthbert's Church, but there is evidence that it dates from the 12th century, in the Norman period. At that time the overlords of Marton were the de Brus family, ancestors of Robert the Bruce of Scotland. They had founded Guisborough Priory in 1119, and succeeding generations of the family bestowed gifts of land and property on this and other religious houses in the area. The church at Marton was one of those gifts to Guisborough, given before 1187. In 1540 when the priory was dissolved by King Henry VIII, all the property belonging to the priory reverted to the Crown. In 1545 the living of Marton was granted to the Diocese of York, where it remains to this day. Captain James Cook was baptised at St Cuthbert's Church. The church is now ornamented with a stained-glass window commemorating Cook. The graves of Henry Bolckow and John Vaughan, the founding fathers of Bolckow Vaughan — the company which brought the steel industry to Middlesbrough – are in the churchyard. The graves, like the company, had been largely forgotten in the 20th century, but were refurbished in 2009. Other notable persons who lived in the parish of Marton include Bolckow's business partner John Vaughan, who lived at Gunnergate Hall until his death in 1868; Sir Raylton Dixon, a Middlesbrough shipbuilder; Henry Cochrane, an ironmaster; Agnes Spencer, the wife of the founder of Marks and Spencer. Marton is also the base for a junior football club, Marton F.C., which was founded in 1982 and for which Jonathan Woodgate, David Wheater and Stewart Downing, subsequent Middlesbrough F.C. professional footballers, once played. Marton has three primary schools: Lingfield Primary School, Captain Cook Primary School and Marton Manor Primary School. There are no secondary schools in Marton. Most pupils go to nearby Nunthorpe School, the King's Academy, in Coulby Newham or Trinity Catholic College. Public houses include the Southern Cross and the Rudds Arms (both on the A172); the former is located adjacent to the A172 / Stainton Way crossroads and the latter close to the A172 / A174 interchange. The Marton Hotel and Country Club (closed October 2017) is located almost directly opposite to the Rudds Arms. Marton railway station (on the Esk Valley Line), is located just off the B1380 (Ladgate Lane), close to the entrance to Ormesby Hall. Although Gypsy Lane railway station is in Nunthorpe, it is closer to most Marton residents than Marton railway station. Northern operate all services on the Esk Valley Line and improvements to the timetable in 2014 meant up to 17 trains (each way) calling at both Marton and Gypsy Lane railway stations through the week, with a full hourly service being introduced in 2017 including on Sundays. ^ "Mystery of hall fire finally solved - 51 years on". The Northern Echo. 2 August 2012. Retrieved 2 July 2018. ^ "Party for young and old marks park's 80 years". The Northern Echo. 24 May 2008. Retrieved 2 July 2018. ^ Historic England. "Memorial to Captain James Cook circa 80 metres south of Captain Cook Birthplace Museum (Grade II) (1137243)". National Heritage List for England. Retrieved 2 July 2018. ^ "Parishes: Marton | British History Online". www.british-history.ac.uk. Retrieved 2 July 2018. ^ Evans, Peter (1995). Church Fabric in the York Diocese 1613–1899: The Records of the Archbishop's Faculty Jurisdiction : a Handlist. Front Cover Borthwick Publications. p. 57. ^ "Evening Gazette: Marton & Nunthorpe". Marton graves of Middlesbrough's founding fathers restored. TS7. 16 May 2009. Archived from the original on 3 June 2010. Retrieved 12 March 2012. ^ "Primary and Secondary Education in Middlesbrough" (PDF). Middlesbrough.gov.uk. pp. 17–18. Retrieved 2 July 2018. ^ "Esk Valley Railway : Northern Rail Timetable". Esk Valley Railway Development Company. Retrieved 7 April 2014. ^ Bowe, Charlotte (10 December 2017). "Timetable changes for new Sunday rail services". The Northern Echo. Retrieved 2 July 2018. Wikimedia Commons has media related to Marton, Middlesbrough. Guisborough is a market town and civil parish in the north-east of England. It belongs to the unitary authority of Redcar and Cleveland, the Tees Valley region and the ceremonial county of North Yorkshire. The population of Guisborough ward in Redcar and Cleveland at the 2011 census was 7,622. The civil parish of Guisborough, including the outlying villages of Upleatham, Dunsdale and Newton under Roseberry, had a population of 17,777. An ironmaster is the manager, and usually owner, of a forge or blast furnace for the processing of iron. It is a term mainly associated with the period of the Industrial Revolution, especially in Great Britain. Gypsy Lane railway station serves the Middlesbrough suburbs of Nunthorpe and Marton; the station lies just within the borough of Redcar and Cleveland in the ceremonial county of North Yorkshire, England. It is located on the Esk Valley Line and is operated by Northern who provide all of the station's passenger services. The station was originally opened by British Rail in 1976. Nunthorpe railway station serves the Middlesbrough suburb of Nunthorpe; the station lies within the borough of Redcar and Cleveland in the ceremonial county of North Yorkshire, England. It is located on the Esk Valley Line and is operated by Northern who provide all of the station's passenger services. One of the two passing loops on the line is located here and there is a level crossing at the eastern end. The signal box that operates it also supervises the movements of trains on the entire branch and remotely controls the junction further down the line at Battersby. Great Ayton railway station serves the village of Great Ayton in the county of North Yorkshire, England. It is located on the Esk Valley Line and is operated by Northern who provide all of the station's passenger services. The Roman Catholic Diocese of Middlesbrough is a Latin Rite Roman Catholic diocese based in Middlesbrough, England and is part of the province of Liverpool. It was founded on 20 December 1878, with the splitting of the Diocese of Beverley which had covered all of Yorkshire. 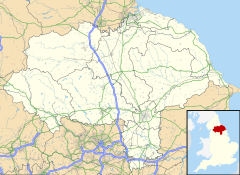 The modern day Middlesbrough diocese covers an area of 4,000 km² in North Yorkshire and the East Riding of Yorkshire, together with the City of York. The Bishop's See is in Coulby Newham, Middlesbrough, at St Mary's Cathedral. James Cook railway station is a station that serves the James Cook University Hospital in Middlesbrough, North Yorkshire, England. It also serves the surrounding areas of Park End, Berwick Hills and the nearby Middlesbrough Sports Village.